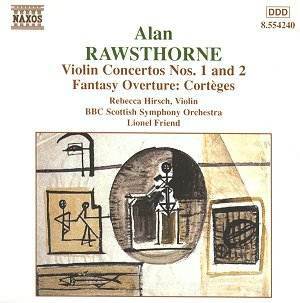 A brief comparative review of the Naxos and Carlton recording of Rawsthorne's Violin Concertos. I have lived with the Naxos performances for about six months - since receiving a cassette of the master - and have come to know them well. Only since their release on CD have I returned to the 1997 Carlton version ; this has pointed up the differences very markedly. As to the recorded sound the new BBC recording made for Naxos suffers from a homogeneous balance between soloist and orchestra, which, together with the studio acoustic, has a levelling effect. This tends to under-characterize the soloist and could leave her disadvantaged by both Olof and Parikian, who are spotlighted at the expense of added astringency and some coarseness, products of the age of the recordings. The Carlton recordings of the orchestral accompaniments are not wholly satisfactory. No.1 was recorded at a public performance in Cheltenham Town Hall in 1972 and has its abrasive moments. Regrettably the mode of recording did not provide for re-recording the fugato bassoon duo in the opening pages of the second movement, playing which goes sadly awry. The Maida Vale studio in which No.2 was recorded in 1968 has an acoustic which is over-resonant, and glaringly analytical. The differences in the recorded sound heighten the contrast between the solo performances. Rebecca Hirsch may seem reticent by comparison, yet drama and attack are by no means lacking, they are tempered by the uniform balance between soloist and orchestra. Hence the First Concerto suffers some attenuation of the panache one expects from the soloist in a work cast in a romantically expansive mould. The Second Concerto is more contemplative, with the soloist fulfilling a concertante-like role. In this regard the Hirsch performance suffers less from the recorded balance than is the case of the First. The authority of Olof's performance of the first Concerto (he gave the first performance at Cheltenham in 1948) derives from Rawsthorne's immediate input and guidance. There is strong emotional content in his performance, a clue for which may be found in a letter in the OUP archive addressed by Olof to Rawsthorne's publisher. This relates to this memorial performance recorded eleven months after the death of the composer. Olof discloses the level of his sorrow at the composer's death and expresses a strong desire to pay tribute to Rawsthorne by performing the work on this occasion. Parikian plays the Second Concerto with similar authority and with sanguine projection, grasping the few virtuoso opportunities the composer provides - unlike the first there is no cadenza. Its directness and conviction yield a very persuasive view of the work. I was doubtful about Hirsch's opening statement in the First Concerto when I first heard it. She accords it a brooding, misterioso, character (not marked in the score). The validity of that approach emerges as the opening section unfolds, adding a dramatic and premonitory constituent which is echoed elsewhere in Rawsthorne's music - think of the opening of the 'Cello Sonata and the first of the Four Romantic Pieces for piano. Unexpected as this may be, it does establish an imaginative approach which finds a response in the conductor. Hirsch is more at home in the Second Concerto. She comprehends the concertante element and accords it a thoughtful and contemplative mien, though meeting the demands of the dramatic moments when they arise. Olof and Parikian are to be cherished for their clear and straight-forward interpretations: they are authentic reference points to return to. Rebecca Hirsch comes to the works with a fresh ear and establishes a new standard, so much so that her readings are not diminished by comparison. Each version has its own character and validity and can stand undiminished alongside its counterpart. Any listener who admires Rawsthorne will want both versions, at these prices it does not have to be a matter of either/or, but if only performance can be afforded, this new CD is the one to invest in. Hirsch consistently appreciates and reveals the lyrical essence which lies at the heart of much of Rawsthorne's writing. The couplings on these CDs also make them complementary. Cortèges is a fine piece, well played and presented here with conviction, wit and drama. The performance of the Divertimento on the earlier CD is rather cursory, missing the subtleties of Rawsthorne's writing (wait for the forthcoming recording by the Northern Chamber Orchestra, conducted by David Lloyd-Jones, also on Naxos). The Improvisations on a Theme by Constant Lambert. also on the Carlton disc, is a valuable addition to the growing list of recorded works; it receives an adequate performance by the BBC Concert Orchestra under Frank Shipway. Three cheers, then, for the accessibility which this bargain issue brings, for the promotion of Rawsthorne by a young performer and for the enterprise of Naxos. The recording was made with financial assistance from the Rawsthorne Trust.